Defensive end Michael Bennett leaps into the air as he is announced before the start of a game between the Seattle Seahawks and the Atlanta Falcons at CenturyLink Field in November. The Seahawks traded Bennett to the Eagles on Wednesday. 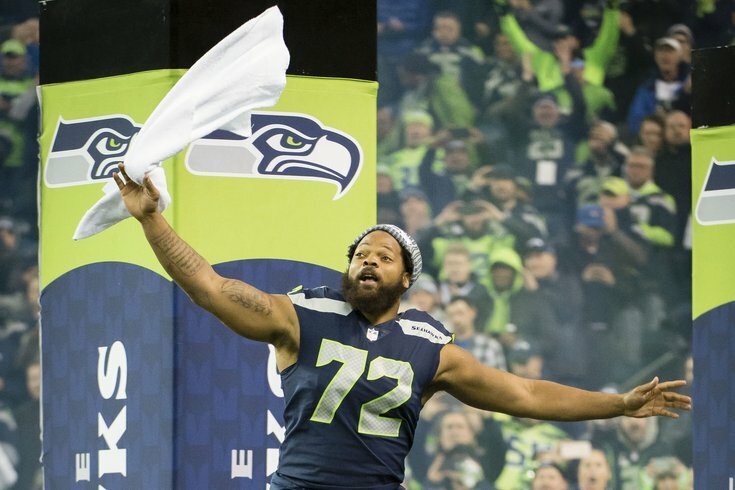 Michael Bennett gave Philadelphia Eagles fans a taste of what to expect next season with his first tweet since learning he had been traded from Seattle to Philly. The trade, which can't be officially announced until the 2018 season starts next week, adds the three-time Pro Bowler on a defensive line that already includes the likes of Fletcher Cox, Brandon Graham, Timmy Jernigan and Derek Barnett. He and a seventh-round draft pick were shipped to Philly for wide receiver Marcus Johnson and a fifth-round pick. Bennett, 32, was one of Seattle's more recognizable players and regularly spoke out on social issues during his time there. NFL Network insider Ian Rapoport even indicated on Tuesday that Bennett's activism may have been a factor in the team's efforts to trade him. But some Philly fans will love this: Not long after the trade was announced, Bennett tweeted a photoshopped picture of himself wearing an Eagles jersey and included a caption that read, "free meek mill." The tweet gave a shoutout to the movement vehemently opposing Meek Mill's prison sentence for probation violations stemming from a decade-old gun and drugs case. The popular rapper and North Philly native continues to serve the sentence in state prison in Chester, but has a post-conviction appeal hearing set for next month. Bennett later thanked Seattle and the Seahawks in a lengthy Instagram post and a follow-up tweet. A number of Eagles players were quick to react to the trade, which bolstered an already potent defensive line but likely cemented defensive end Vinny Curry's departure. Gonna miss playing with my man @Mojomdj ... keep grinding man and keep believin’! At the same time, welcome to the squad @mosesbread72 ! Excited to have you!